New to Mom to Mom Nutrition? Here's what I think you'll find most helpful. Hi! I’m Katie. Thanks for for stopping by my online cooking space, or kitchen, aka Mom to Mom Nutrition. From family-friendly recipes, handling those picky eaters, AND dealing with body image post baby, I hope you find just what you’re looking for! You can read more about me here. So, each week, I share just that: recipes and real-life. And would love for you to grab your cup of coffee or red wine and join in the conversation! 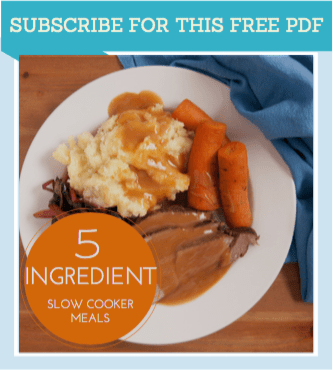 I truly appreciate each and every one of you, and to welcome you to the community, I'll send you my free Slow Cooking 101 PDF download. Use my basic formula to build healthy fix-it and forget-it meals the whole family will love! It's easy to print and keep in the kitchen, plus it includes five recipes that you can make right away. Plus, see more of my favorite FREE resources! When you become a parent, there are a few things friends and family are quick to give advice on: infant sleep[less] schedules, the continuous ear infections, and taking time for “you” when you can. But one thing that perplexes many of us is something that our days with small children revolve around: FOOD! While I’m not here to solve every feeding problem and issue that comes along with your child’s early years of life, I’ve found a few things that work when it comes to expanding your toddler’s picky palate.